For the women's team, see Iran women's national football team. "Team Melli" redirects here. For other national teams, see Category:National sports teams of Iran. The Iran men's national football team (Persian: تیم ملی فوتبال مردان ایران‎, translit. Tīm-e Melli-e Fūtbāl-e Mardān-e Īrān), also known as Team Melli (Persian: تیم ملی‎, translit. Tīm-e Melli, lit. 'the national team'), represents Iran in international football competitions and is governed by the Iran Football Federation. From December 2014 until May 2018, the men's national football team of Iran remained the highest-ranked team in Asia, representing the longest continuous period of time a team has been top of the continent in the rankings. Iran is one of the most successful men's national teams in Asia with three Asian Cup championships (1968, 1972, and 1976). Iran's best performance at the Olympics was reaching the quarterfinals in the 1976 Montreal Games. Iran has qualified for the World Cup five times (1978, 1998, 2006, 2014, and 2018) but has never advanced past the group stage. They have, however, won two matches in the World Cup, one against the United States in 1998, and their opener against Morocco in 2018. The very first Iran selection football team that traveled to Baku in 1926. The Iranian Football Federation was founded in 1920. In 1926 Tehran XI (selected players from Tehran Club, Toofan F.C. and Armenian Sports Club) traveled across the border to Baku, USSR, this was the first away football match for an Iranian team. This Tehran Select team is the predecessor of Iran's national football team. The first match that Team Melli played was on 23 August 1941, away at Kabul in a 1–0 win against British India, while Iran's first FIFA international match was on 25 August 1941, away at Afghanistan. Iran won the Asian Cup three consecutive times (1968, 1972, 1976), to which the team has not been able to add since. In 1978, Iran made its first appearance in the World Cup after defeating Australia in Tehran. Iran lost two of three group stage matches against the Netherlands and Peru. Team Melli managed to surprise the footballing community by securing one point in its first ever World Cup appearance against Scotland which saw Iraj Danaeifard cancel out an own goal scored by Andranik Eskandarian for the 1–1 draw. After the 1979 Revolution, football was somewhat neglected and cast aside. During the 1980s, the Iranian national team did not feature in World Cup competitions due to the Iran–Iraq War (1980–88) and domestic football suffered the inevitable effects of conflict. The national team withdrew from the Asian qualifiers for the 1982 World Cup, and refused to participate in the qualifiers for the 1986 World Cup because of having to play on neutral ground. The war and political upheavals left Iran without major club competitions until 1989 when the Qods League was established. A year later, the Qods League was renamed the Azadegan League. Despite failing to qualify for either the 1990 or the 1994 World Cups, it was during this period that a number of quality players burst onto the Iranian football scene, laying the foundation for third place in the 1996 AFC Asian Cup (memorable victories in that tournament included a 3–0 victory against Saudi Arabia and an impressive 6–2 victory against South Korea) and their second stab at World Cup glory in 1998. In November 1997, Iran qualified for the 1998 World Cup after eliminating Australia in a close playoff series. Both games finished undecided, but Iran managed to qualify due to the away goals rule. Iran held Australia to a 1–1 draw at home, and a 2–2 draw in Melbourne; however, since Iran had scored more away goals, they were able to qualify for the Cup. At their first game of the Group F at the 1998 FIFA World Cup, Iran played well against Yugoslavia, losing narrowly 1–0, only to a free kick goal by Siniša Mihajlović. Iran recorded their first World Cup victory in the second game, beating the United States 2–1, with Hamid Estili and Mehdi Mahdavikia scoring goals for Iran. The Iran vs USA World Cup match was preheated with much excitement because of each country's political stance after the Iranian revolution and the Iran hostage crisis. However, in an act of defiance against all forms of hatred or politics in sports, both sides presented one another with gifts and flowers and took ceremonial pictures before the match kickoff. Following defeat against Iran, the United States was eliminated from the World Cup. Iran finished first in the group stage of the tournament, but lost to South Korea in the quarter-finals. Iran failed to qualify for World Cup 2002 after an aggregate defeat to the Republic of Ireland, losing 2–0 in Dublin and winning 1–0 in Tehran. The elimination saw manager Miroslav Blažević step down from the top spot to be replaced by his assistant Branko Ivanković, who stepped up from assistant coach. After qualifying to the Asian Cup 2004, Iran was drawn with Thailand, Oman, and Japan in the tournament. Iran finished second in this group. In quarter-final clash against South Korea, Iran won 4–3 in normal time. In the semi-final, Iran lost to the host, China on penalty kicks. Iran won against Bahrain 4–2 to finish third place in the tournament. Iran score against Angola during a 2006 FIFA World Cup match. On 8 June 2005, Iran together with Japan became the first country to qualify for the 2006 World Cup, making it Iran's 3rd appearance on the world stage of football. The qualification round both in 2001 and 2004–05 resulted in mass celebrations, hysteria and rioting, causing internal chaos and unrest between youth and government officials. The Iran versus Japan leg of the 2006 World Cup qualifiers in Tehran, played on 24 March 2005, was the highest attended qualifying match among all confederations. The match ended in tragedy with 5 fans killed and several others injured as they left the Azadi Stadium at the end of the match. Iran started their 2006 FIFA World Cup appearance with high expectations from fans and media. Their first match was against Mexico in Group D. The game was level 1–1 at the half-time, but Iran lost at the end because of a defensive mistake. The final score, 3–1, was brought about by goals from Omar Bravo and Sinha for Mexico, with Yahya Golmohammadi scoring the only Iran goal. Iran played against Portugal in the second game. The game was lost 2–0. The goals were scored by Deco and Cristiano Ronaldo (penalty). The two losses meant Iran was eliminated from the competition, before their third and final game against Angola. Iran drew 1–1 with Angola on 21 June 2006, Sohrab Bakhtiarizadeh scoring the Iran goal. In November 2006, Iran was suspended by FIFA from all participation in international football, on the grounds of governmental interference in the national football association. The ban lasted less than a month, and as a dispensation was given to allow the Iran under-23 team to participate in the football competition of the 2006 Asian Games, fixtures were unaffected. IRIFF appointed Amir Ghalenoei as head coach of the Iran national football team on 17 July 2006 to succeed Branko Ivanković. After finishing first in the qualifying round 2 points ahead of South Korea and then finishing first in the group stage of the final tournament in Malaysia, Iran lost to South Korea in a penalty shoot-out of the quarterfinal match and was eliminated from the 2007 Asian Cup. Ghalenoei was heavily criticized by the press. After a period of discussion in the Iranian football federation, his contract was not renewed and Team Melli was left with a caretaker manager for several months. Ali Daei was chosen to become the new coach after Spanish coach Javier Clemente had been close to signing on as Iran's national team manager but talks collapsed when he refused to live full-time in the country. Iran was in the same FIFA World Cup qualifying group as Kuwait, Syria and United Arab Emirates in the third round. They played home and away against each of the other three teams in group 5. In the middle of the fourth round, Ali Daei was let go from his position as the Iranian national coach on 29 March 2009. He was replaced by Afshin Ghotbi. Iran failed to qualify for the 2010 World Cup after ranking 4th overall in its group. Iran renewed the contract with Afshin Ghotbi until the end of 2011 AFC Asian Cup and the team qualified to the tournament with 13 points as the group winners. During the final qualification match against South Korea, several Iranian players started the match wearing green armbands or wristbands, a symbol of protest at the outcome of the Iranian presidential election. Most removed them at half-time. The newspaper Iran reported that Ali Karimi, Mehdi Mahdavikia, Hosein Kaebi, and Vahid Hashemian had received life bans from the Iranian FA for the gesture. However, the Iranian FA denied this claim in a response to FIFA's inquiry saying that "the comments in foreign media are nothing but lies and a mischievous act." Head coach Afshin Ghotbi also confirmed that it was a rumour and Iranian FA "has not taken any official stand on this issue." Afshin Ghotbi was able to qualify for 2011 Asian Cup and finished second in West Asian Football Federation Championship 2010 just a few months before the 2011 Asian Cup. Iran was able to gain all nine points in the group stage of the 2011 Asian Cup but after an extra time goal from South Korea, Iran was yet again unable to get to the semifinals of the competition. On 4 April 2011, former Real Madrid manager Carlos Queiroz agreed to a two-and-a-half-year deal to coach the Iranian national team until the end of the 2014 FIFA World Cup in Brazil. Under Queiroz, Iran began their World Cup qualification campaign successfully, defeating the Maldives 4–0 in the first leg of their second round of qualifiers. After winning 5–0 on aggregate, Iran advanced to the third round of qualifiers, where they were drawn with Indonesia, Qatar and Bahrain. Iran highlighted their position at the top of their group by defeating Bahrain 6–0 at home in the Azadi Stadium, as well as inviting former German youth international, Ashkan Dejagah, who scored twice on his debut against Qatar. After a 4–1 win at Indonesia, Iran qualified for the final round of direct qualifiers, the fourth round. In the fourth round, Iran was drawn with South Korea, Qatar, Uzbekistan, and Lebanon in their group. Queiroz made new foreign-based additions to his squad, adding players such as Reza Ghoochannejhad to his team. Iran started their fourth round of Asian qualifiers with a 1–0 win in Uzbekistan. Team Melli then drew Qatar and lost in Lebanon before defeating South Korea at the Azadi on 16 October with a goal from captain Javad Nekounam. After a 1–0 loss in Tehran against Uzbekistan, Iran defeated Qatar 1–0 in Doha and Lebanon 4–0 at home. In their last qualification match, Iran defeated South Korea 1–0 in Ulsan Munsu with a goal from Ghoochannejhad, resulting in their qualification to the 2014 FIFA World Cup as group winners with 16 points. Thus, Iran became the third team that Queiroz has managed to qualify for the World Cup, having reached the 2002 edition with South Africa and the 2010 edition with Portugal, leading the latter to a knockout stage finish. Iran continued their winning streak, securing qualification to the 2015 Asian Cup months later as well. Since Queiroz's role as manager of the Iranian national team, he has been renowned for introducing players from the Iranian diaspora to the national squad. These players include German-Iranians Daniel Davari and Ashkan Dejagah, Dutch-Iranian Reza Ghoochannejhad, Swedish-Iranians Omid Nazari and Saman Ghoddos, and Iranian-American Steven Beitashour among others. Iran qualified for the 2014 FIFA World Cup as group winners and competed in Group F alongside Argentina, Nigeria, and Bosnia and Herzegovina. The sold out Argentina match tickets were among the eight most purchased for this edition of the tournament. On 1 June 2014, Queiroz announced his 23-man squad. Prior to the tournament, they founded the Central Asian Football Association. In the opening match of the tournament on 16 June, Iran drew Nigeria 0–0, making it their first clean sheet of the FIFA World Cup. In their next match, Iran was defeated by Argentina 1–0 with a late goal from Lionel Messi, and received praise after holding Argentina for 90 minutes while creating some attacking opportunities of their own. Iran was eliminated from the tournament in their next game, a 3–1 defeat to Bosnia and Herzegovina. Iran's lone goal was scored by Reza Ghoochannejhad. After the tournament, Queiroz declared he would resign as manager of Iran, but later switched and extended his contract until the 2018 FIFA World Cup. Iran qualified for the 2015 AFC Asian Cup as group winners, where Team Melli were the highest ranked seed. Iran faced Bahrain, Qatar and the UAE in Group C. Queiroz announced his squad on 30 December 2014. With the second highest number of fans in the tournament after hosts Australia, the Iranians defeated Bahrain 2–0 with limited preparations. A defensive minded Iran then defeated Qatar 1–0 thanks to a Sardar Azmoun goal before defeating the UAE by the same scoreline to reach the top of their group. In the quarter-finals Iran faced Iraq, who they had beaten weeks prior in a friendly match. Having received a controversial red card in the first half, Iran competed with ten men, managing to score goals late in extra time to draw the match 3–3. In the ensuing penalty shootout, Iran lost 7–6 in sudden death. Iran's squad against Portugal in Mordovia Arena at the 2018 FIFA World Cup. Iran began their 2018 FIFA World Cup qualification campaign with friendly matches against Chile and Sweden in March 2015. Queiroz resigned from his managerial post thereafter due to disagreements with the Iranian Football Federation. On 14 April 2015, Iran were drawn with Oman, India, Turkmenistan, and Guam in the second round of qualifiers. On 26 April, Queiroz announced that he would continue as the manager of Iran for their 2018 World Cup campaign. Iran became the second team to qualify for the 2018 World Cup, after a 2–0 win at home over Uzbekistan on 12 June 2017. They also clinched 1st place in their qualification group after South Korea's defeat to Qatar. Iran won the first match against Morocco after Aziz Bouhaddouz scoring an own goal. The second match Iran lost against Spain with a goal scored by Diego Costa. The third match against Portugal ended in a draw after the penalty scored by Karim Ansarifard, and because Morocco could only manage a 2–2 draw to Spain, Iran was eliminated. However, this has become Iran's best performance in the World Cup to date, when they achieved four points. During the final game of the 2010 FIFA World Cup qualifiers against South Korea in Seoul on 17 June 2009, seven members of the team, Javad Nekounam, Ali Karimi, Hossein Kaebi, Masoud Shojaei, Mohammad Nosrati, Vahid Hashemian, and captain Mehdi Mahdavikia wore green wristbands in support of the Iranian Green Movement during the 2009 Iranian election protests. Initial rumors and false reports were that all seven players were banned for life by the Iranian Football Federation, however, state-run media claimed that all seven had "retired". On 24 June 2009, FIFA wrote to Iran's Football Federation asking for clarification on the situation. The Iranian Football Federation replied that no disciplinary action has been taken against any player. As of 2014 FIFA World Cup qualification, many of the above players have played again for the national team, notably Javad Nekounam, Masoud Shojaei, Mehdi Mahdavikia, and Ali Karimi. The Iranian national team has received several nicknames by supporters and media. The most common one used is "Team Melli", which literally means "The National Team" in Persian language. Although the Iranian supporters have popularized "Team Melli", other nicknames for the team include "Persian Stars" (entitled since the World Cup 2006) "Shiran e Iran", meaning "The Iranian Lions" or "The Lions of Persia", "Shirdelan", "Lion Hearts" and "Princes of Persia" (used since AFC Asian Cup 2011) have been used in media as well. Iran's slogan for the 2014 FIFA World Cup was Honour of Persia, selected in an internet poll held by FIFA. A recently used nickname, due to the presence of the Asiatic cheetah on the 2014 World Cup jersey, is Youzpalangan which means 'The Cheetahs' (Persian: یوزپلنگان). Wikimedia Commons has media related to Iran national football team kits. The Iran national football team's kit traditionally utilizes white. The table below shows the history of kit supplier for the Iranian national football team. Iran and South Korea are sporting rivals and have played against each other officially since 1958, totally 29 matches as of October 2016, including eight World Cup qualifiers. These two teams were among the strongest Asian national football teams during the 1960s and 1970s. Since then, the teams have developed one of Asia's greatest rivalries. Although the teams only had one chance to play against each other in the final match of the AFC Asian Cup, in 1972, they faced each other five consecutive times at the quarterfinals stage from 1996–2011. Iran leads the series with 13 wins, 7 draws and 9 losses. Iran and Saudi Arabia are rivals. The game has been ranked 9th in Bleacher Report's "International Football's 10 Most Politically-Charged Football Rivalries" and 8th in Goal.com's "Football's 10 Greatest International Rivalries". Iran and Saudi Arabia have had 15 matches so far. All of their matches have been competitive and they have never played a friendly match. The first match was played on 24 August 1975, with Iran defeating Saudi Arabia 3–0. Iran leads the series with 5 wins, 6 draws and 4 losses. According to the Malay Mail, "Emotions are always high when Iran and Iraq meet on the football pitch". The rivalry is not such a football-inspired ill-feeling between the two, but more of geography, religion and history. Iran and Iraq are neighboring countries, sharing a long history. In the contemporary era, especially during the reign of Saddam Hussein, the two countries had bad relations and fought the Iran–Iraq War for 8 years. In 2001, for the first time in decades, an Iran-Iraq match was not held at a neutral venue. The rivalry was escalated after Iraq knocked Iran out of the 2015 AFC Asian Cup in controversial circumstances; Iran lodged a complaint to the AFC that one of Iraq's players had submitted a positive doping test months before, hoping to see Iraq removed from the tournament and themselves reinstated in their place, but the complaint was rejected. Iran leads the series with 14 wins, 7 draws and 5 losses. Since 1972, Iran's national stadium is Tehran's Azadi Stadium with a nominal capacity of 78,116 spectators. Azadi Stadium is the 23rd largest association football stadium in the world, 7th in Asia and 1st in West Asia. A record was set in Azadi for the 1998 FIFA World Cup qualifier against Australia with over 128,000 in attendance. The government restricts Iranian women from entering the stadiums. From 1942 to 1972, Amjadieh Stadium was Iran's national stadium. The other stadiums that Iran has been played international games are Yadegar Emam Stadium (Tabriz), Takhti Stadium (Tehran) and Enghelab Stadium (Karaj). The Iran National Football Camp is home to Iran's trainings. Primary sponsors include Adidas, Bank Pasargad, 9090, Golrang, Oila and Kaspid. On 1 February 2014, Iran announced the addition of the endangered Asiatic cheetah on their 2014 FIFA World Cup kits in order to bring attention to its conservation efforts. 1997 Champions ? ? ? ? ? ? ? ? The following 23 players have been called up for 2019 AFC Asian Cup. Caps and goals correct as of 28 January 2019, after the match against Japan. The following players have been called up for the team in the last 12 months. INJ Player withdrawn from the squad due to an injury. RC Player suspended for yellow or red card accumulation. RET Player retired from the national team. Since 2002, the Asian Games has been part of the under-23 team's record. Javad Nekounam is the most capped player in the history of Iran with 151 caps. Ali Karimi of Iran with 127 caps and 38 goals. Jalal Hosseini of Iran with 115 caps. Iranian iconic goalkeeper Ahmadreza Abedzadeh is the most capped goalkeeper in the history of Iran with 79 caps. The records are collected based on data from FIFA and RSSSF. Bold names denote a player still playing or available for selection. The records are collected based on data from FIFA, RSSSF & Varzesh3. ^ Veo, Valerio (23 November 2014). "Team Melli looked excellent in defeat". ESPNFC.com. Retrieved 11 January 2015. ^ FIFA.com. "The FIFA/Coca-Cola World Ranking - Ranking Table - FIFA.com". ^ "Biggest margin victories/losses (Fifa fact-Sheet)" (PDF). FIFA.com. Retrieved 27 November 2013. ^ a b "Iran: Fixtures and Results". FIFA.com. ^ "Asian Games 1958 (Tokyo, Japan)". rsssf. ^ "Fan Forum". PersianFootball.com. Retrieved 28 January 2014. ^ "Iran: FIFA/Coca-Cola World Ranking". FIFA.com. Retrieved 23 December 2016. ^ "Member Association – Iran". ^ "Iran in World Cup 1978". teammelli.com. ^ "Iranian football facts". BBC News. 1 November 2001. Retrieved 5 May 2010. ^ a b "while FIFA World Cup 2006 Iran Team Overview". Archived from the original on 19 July 2008. ^ a b "The History of Soccer in Iran". iranvisitor.com. ^ "A third half for Iranian football". mondediplo.com. ^ "France 1998 World Cup: 1st Round – Day 12 Match Reports". 1800-worldcup.com. ^ "World Cup: U.S. eliminated from Cup after 2–1 loss to Iran". soccertimes.com. ^ "FIFA.com – 1998 FIFA World Cup France". ^ "France 1998 World Cup: 1st Round – Day 16 Match Reports". 1800-worldcup.com. ^ "Five die after Iran football game". BBC. 26 March 2005. Retrieved 7 June 2013. ^ "FIFA suspends Iran Football Federation". FIFA. Archived from the original on 2 January 2007. Retrieved 27 November 2006. ^ "FIFA to lift Iran ban: Blatter". the-AFC.com. Archived from the original on 23 June 2007. Retrieved 17 December 2006. ^ "FIFA President announces temporary lifting of Iran ban". the-AFC.com. Archived from the original on 23 June 2007. Retrieved 27 November 2006. ^ "Ali Daei named new Iran coach". soccerway.com. ^ Tait, Robert (30 March 2009). "Iran football coach Ali Daei loses job following team's defeat". The Guardian. London. Retrieved 5 May 2010. ^ "FIFA.com". FIFA.com. Retrieved 7 September 2010. ^ "Iranian football team shows support for Mousavi with green arm bands at Seoul World Cup qualifier". The Daily Telegraph. London. 17 June 2009. Retrieved 17 June 2009. ^ Tiat, Robert (25 June 2009). "Iranian players receive life bans for gestures". The Guardian. Retrieved 25 June 2009. ^ "Iran denies punishing players for wearing green wristbands". London: The Daily Telegraph. 25 June 2009. Retrieved 25 June 2009. ^ Bell, Jack (26 June 2009). "Iran Did Not Suspend Players, Coach Says". The New York Times. Retrieved 27 June 2009. ^ Soccernet, Goal (4 April 2011). "Carlos Queiroz agrees deal to become Iran head coach". Sport. Dubai: Soccernet. Retrieved 4 April 2011. ^ "Asian Cup 2015 (Qs) MD5: Lebanon 1–4 Iran". AFC. 20 November 2013. Archived from the original on 14 May 2014. ^ "5 Iran Players to Watch at the World Cup". ABC News. Retrieved 16 April 2014. ^ "Ashkan Dejagah says Felix Magath is the right man to keep Fulham up". The Guardian. 18 April 2014. Retrieved 19 April 2014. ^ "Iran – Argentina sold out is among top eight in Brazil". persianfootball.com. ^ "Queiroz trims Iran squad to 24". FIFA.com. 1 June 2014. Archived from the original on 1 June 2014. Retrieved 1 June 2014. ^ "Iran 0–0 Nigeria: Super Eagles play out World Cup's first goalless draw". Mail Online. ^ David Ornstein. "BBC Sport – World Cup: Argentina 1–0 Iran". BBC Sport. ^ Olly Groome. "Iran's Rez Ghoochannejhad becomes Charlton's first ever player to score a goal at the World Cup after 3–1 loss to Bosnia and Herzegovina". cafc.co.uk. Archived from the original on 30 July 2014. ^ "Queiroz ends contract saga by signing Iran deal". Reuters UK. ^ "Hosts Australia top seeds for 2015 Asian Cup". Reuters. Retrieved 18 March 2014. ^ "Queiroz Names Team Melli Squad". afcasiancup.com. 30 December 2014. Archived from the original on 1 January 2015. ^ "Iranian crowd sets Asian Cup standard". yahoo.com. Archived from the original on 24 January 2015. ^ "Queiroz: Iran 'victimised' by sanctions - Goal.com". Goal.com. ^ "#teammelli: Social media helps Iranian fans defy censorship of images from Asian Cup matches in Australia". ABC News. ^ "Iran 1 - 0 UAE Match report - 1/19/15 Asian Cup - Goal.com". goal.com. ^ "Former Socceroos blast referee Ben Williams for 'embarrasing' [sic] send-off in Iran's Asian Cup loss to Iraq". The Sydney Morning Herald. ^ Joe Gorman. "Iranian women stand united in protest and hope at Asian Cup". the Guardian. ^ "Iran 2 - 0 Chile Match report - 3/26/15 Friendlies - Goal.com". goal.com. ^ "Ibra silences raucous Iran fans to give Sweden 3–1 win". Reuters UK. ^ Sveriges Radio. "Regimkritiska budskap på Friends kan ge böter". sverigesradio.se. ^ "Asian Football News – Queiroz quits as Iran coach – FOX SPORTS". FOX SPORTS. Archived from the original on 23 March 2015. ^ "Asian draw throws up derbies and drama". FIFA.com. 14 April 2015. ^ AP (13 June 2017). "Iran become second team to qualify for World Cup". Khaleej Times. Tehran. Retrieved 15 June 2018. ^ AP (12 June 2017). "Iran second team to qualify for 2018 World Cup after beating Uzbekistan". USA Today. Gannett. Retrieved 15 June 2018. ^ Church, Michael (11 June 2017). "China, Qatar face elimination as Iran look to Russia". Reuters. Retrieved 15 June 2018. ^ Miller, Nick (15 June 2018). "Aziz Bouhaddouz own goal in added time hands Iran win against Morocco". The Guardian. Guardian News and Media Limited. Retrieved 15 June 2018. ^ White, Jim; Bloom, Ben (20 June 2018). "Fortunate Diego Costa goal sees Spain overcome Iran's stubborn resistance". The Daily Telegraph. Telegraph Media Group Limited. Retrieved 21 June 2018. ^ "Late penalty holds Portugal to runner-up spot in Group B". Marca (in Spanish). Unidad Editorial Información Deportiva, S.L.U. 25 June 2018. Retrieved 26 June 2018. ^ Gonzalez, Roger (25 June 2018). "Iran scores, results: World Cup ends after nearly forcing Ronaldo, Portugal on brink of elimination". CBS Sports. CBS Interactive Inc. Retrieved 26 June 2018. ^ Clayton, Andy (24 June 2009). "Iran soccer players banned from national team after wearing green pro-opposition wristbands". NY Daily News. New York. Retrieved 8 July 2010. ^ Robert Tait (23 June 2009). "Iran bans election protest footballers". The Guardian. Retrieved 16 December 2017. ^ "Iran says it didn't punish soccer players". CBC. 26 June 2009. Retrieved 8 July 2010. ^ "UAE 0–3 Iran: Team Melli Cruise Into Quarter-Finals". Goal.com. Retrieved 21 October 2013. ^ "Iran 1–0 Russia: Khalatbari Strike Sinks The Sbornaya". Goal.com. Retrieved 21 October 2013. ^ "Iran vs North Korea: prepare for the UFWC 'megaclash'". UFWC. 23 September 2012. Retrieved 21 October 2013. ^ "Elephants surrounded by the lions of Iran (in Persian)". khabarsport.com. 15 October 2013. Archived from the original on 22 October 2013. Retrieved 22 October 2013. ^ "The AFC website hailed Rahman Ahmadi the goalkeeper of Iranian lions (in Persian)". Varzesh11. Retrieved 22 October 2013. ^ "The Lions of Persia". Public Broadcasting Service (PBS). 12 June 2012. Retrieved 22 October 2013. ^ "Traditional powers eye return to glory (Princes of Persia become Kings of Asia)". ESPN. 6 January 2011. Retrieved 21 October 2013. ^ "Princes of Persia Rout Qatar Army" (PDF). Iran-daily. Retrieved 22 October 2013. ^ "Princes of Persia' to begin 2011 event". Press TV. Archived from the original on 23 October 2013. Retrieved 22 October 2013. ^ "What a despicable slogan for Iranian soccer team". CNN iReport. Retrieved 22 October 2013. ^ Matt Knight, CNN (15 May 2014). "World Cup 2014: FIFA's bus slogans cause misery and mirth on social media". CNN. ^ "The Winners". fifa.com. Retrieved 10 June 2014. ^ a b "Iran's World Cup kits unveiled [PHOTOS]". PersianFootball.com. Retrieved 1 February 2014. ^ "Iran national football team (Team Melli) 1980 Asian Cup and 1980 Olympic qualifiers". ^ "تیم ملی و آدیداس بعد از 40 سال به هم رسیدند". ^ "برند ایتالیایی اسپانسر تیم ملی شد". Varzesh3.com. ^ "توافق حاصل شد/ تیم ملی آدیداس می پوشد". 90tv.ir. ^ "South Korea proposes a friendly match with Iran". teammelli.com. 5 July 2013. Retrieved 19 October 2013. ^ "The (Hopefully) Last Qualifier – Korea vs Iran". taegukwarriors.com. 17 June 2013. Retrieved 19 October 2013. ^ "Asia's finale sees three spots up for grabs". FIFA.com. 17 June 2013. Retrieved 19 October 2013. ^ "Holders Iraq went through to quarterfinals". cnn.com. 19 January 2011. Retrieved 19 October 2013. ^ "Iran's defeat sends Cho back to the drawing board". ESPN Internet Ventures. 7 September 2010. Retrieved 19 October 2013. ^ "Saudi Arabia VS Iran: Launch pad for Saudi reign". FIFA.com. 28 October 1993. Retrieved 21 November 2014. ^ Peters, Jerrad (15 October 2014). "International Football's 10 Most Politically-Charged Football Rivalries". Bleacher Report. Archived from the original on 17 October 2015. Retrieved 21 November 2014. ^ Staunton, Peter (17 November 2010). "Football's 10 Greatest International Rivalries; Argentina – Brazil, Portugal – Spain, Algeria – Egypt, Japan – South Korea And More". Goal.com. Retrieved 21 November 2014. ^ Duerden, John. "Asia awaits neighbourly rivalry". ESPN. Retrieved 22 November 2014. ^ Montague, James (13 January 2011). "Pitch Warfare: Iran face Iraq in soccer grudge match". CNN. Retrieved 21 November 2014. ^ a b "Iran-Iraq classic rivalry". Iran Daily (4924). 5 November 2014. p. 11. ^ "Iraq vs. Iran a 53 years old rivalry". Team Melli. Retrieved 20 May 2017. ^ "Trouble flares after Iran beat Iraq". BBC. Retrieved 20 May 2017. ^ "Asian Cup: Iran claims Iraq's Alaa Abdul-Zahra tested positive, lodges complaint about quarter-final result". 25 January 2015. ^ "AFC rejects Iranian protest over Iraqi player ineligibility". 25 January 2015. ^ "Azadi Stadium Capacity". Varzesh3. 23 July 2016. ^ "World Cup ban? Iran's women just don't care". Telegraph.co.uk. 26 June 2014. ^ "فدراسیون فوتبال جمهوری اسلامی ایران". ffiri.ir. ^ FIFA.com (26 May 2011). "Iran says farewell to 'The Legend'". ^ "Statistics: Iran [ Team Melli]". ^ "بیشترین کاپیتانی". تبیان. 24 June 2015. ^ "کاپیتان های تیم ملی چطور خداحافظی کردند/ازحبیبی،قلیچ خانی،پروین و دایی تا نکونام -". khabaronline. ^ "de beste bron van informatie over sport. Deze website is te koop!". parssport.ir. Archived from the original on 24 July 2011. Retrieved 7 September 2010. ^ "de beste bron van informatie over ورزشی. Deze website is te koop!". parssport.ir. Archived from the original on 24 July 2011. Retrieved 7 September 2010. ^ "de beste bron van informatie over ورزشی. Deze website is te koop!". parssport.ir. Archived from the original on 17 February 2010. Retrieved 7 September 2010. ^ "de beste bron van informatie over ورزشی. Deze website is te koop!". parssport.ir. Archived from the original on 6 January 2010. Retrieved 7 September 2010. ^ "de beste bron van informatie over ورزشی. Deze website is te koop!". parssport.ir. Archived from the original on 5 January 2010. Retrieved 7 September 2010. 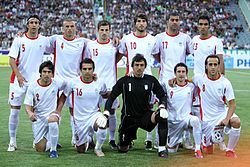 Wikimedia Commons has media related to Iran national football team.